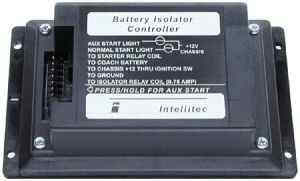 The Intellitec Battery Isolator Controller performs two important functions. First, it provides a method of charging and isolating dual batteries in an RV. It also provides automatic auxiliary starting from the house batteries when the coach battery is unable to provide sufficient starting power. Indicator lamp drivers are included to signal the driver of both normal and auxiliary start. This unit combines the functions of the conventional diode isolator and manually operated auxiliary start functions. The unit is housed in a plastic enclosure suitable for mounting near the batteries or in an engine compartment. It operates in combination with a conventional continuous duty cycle isolator relay as has been used by a number of RV manufacturers.